Apollo 11 astronaut Buzz Aldrin walks on the moon in July 1969 in this photo snapped by Neil Armstrong. MOUNTAIN VIEW, Calif. — Buzz Aldrin may be a strong supporter of private spaceflight, but the famed Apollo 11 moonwalker apparently has no desire to make a trip himself — at least not to suborbital space. When a commercial suborbital spaceflight company offered Aldrin — the second human ever to walk on the moon — a free seat aboard one of its spaceships, Aldrin politely declined, the moonwalker said Thursday (June 27) during a press conference announcing the new space-commerce initiative PayPal Galactic. The former astronaut and fighter pilot did not name the company, but major contenders could be Virgin Galactic or XCOR Aerospace, both of which aim to start flying customers in the next year or so. "Who's going to get the publicity out of me flying in your spacecraft? And who's taking the risk? I don't quite see where there's a payoff in there," Aldrin, 83, said here at the SETI (Search for Extraterrestrial Intelligence) Institute, which is collaborating with PayPal on the PayPal Galactic project. "Besides, I've been there before," Aldrin added, and laughter filled the room. Buzz Aldrin salutes the camera in this still from a promotional video for the AXE Space Academy, a contest that aims to launch 22 winners on suborbital flights aboard XCOR Aerospace's Lynx spacecraft. But Aldrin is working to help get suborbital spaceflight, and the private spaceflight industry in general, off the ground. For example, he's an ambassador for the AXE Apollo Space Academy, a global contest sponsored by the men's personal care product company AXE that promises to send 22 people to the edge of space and back aboard XCOR's Lynx rocket plane. 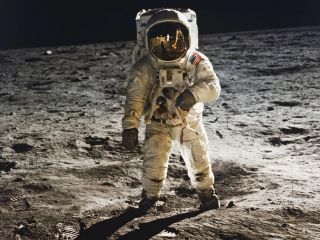 Buzz Aldrin, who stepped onto the surface of the moon just after Neil Armstrong in July 1969, sees private spaceflight playing a key role in the years ahead, helping humanity expand its footprint out into the solar system. "Today, we're on the cusp of a new era in space," Aldrin said. "The [space] shuttles have been retired; the dawn of commercial spaceflight is upon us. Our robotic science probes are spread throughout the solar system, even reaching beyond it. It's not unrealistic to predict we're only a generation away from a permanent human presence on Mars." Follow Mike Wall on Twitter @michaeldwall and Google+. Follow us @Spacedotcom, Facebook or Google+. Original article on SPACE.com.